Fresno State has endured a long stretch of ineptitude when visiting Boise State. The No. 23 Bulldogs are aiming to stomp out a nine-game losing streak in Idaho's capital city when they take on the Broncos in a Mountain West showdown on the famed blue turf on Friday. Fresno State's last win in Boise occurred while the field had a green surface, back in 1984. The most recent setback in Boise came in last season's Mountain West conference title game when the Broncos prevailed 17-14. "They're a great program and a great team," Bulldogs coach Jeff Tedford told reporters. "It's going to be a struggle. It's going to be a short week and so we're going to have to get into the game plan right away going on the road on a short week. "Our guys know what that is all about. We know what we're up against with them. They're a class team and we're going to have to play our best." 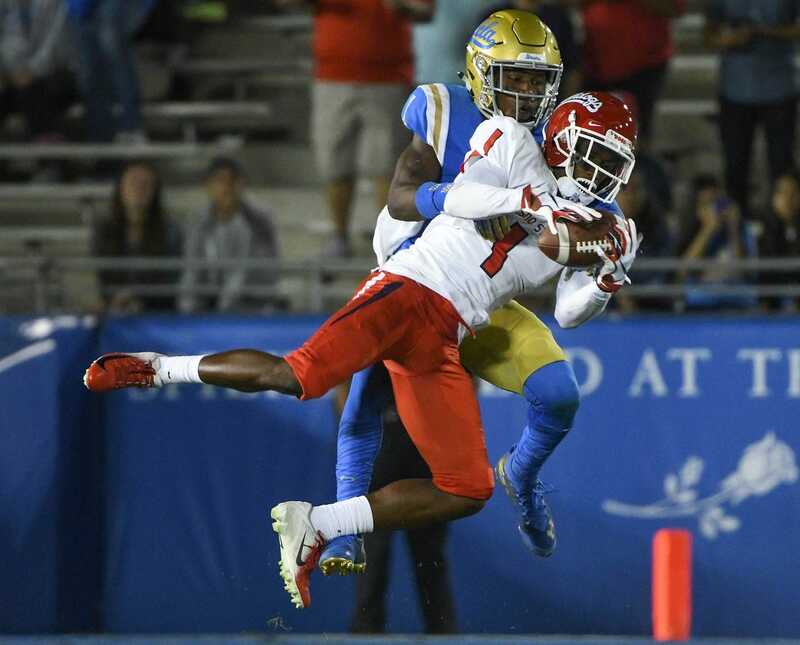 The contest is vitally important for Fresno State (8-1, 5-0 Mountain West) with the program being on the short list of teams in the hunt for a New Year's Six bowl bid. The Bulldogs have been one of the nation's biggest surprises and have won seven straight games. But the game also represents an opportunity for Boise State (7-2, 4-1) to get back in that conversation after losses to Oklahoma State and San Diego State removed them from the discussion. The Broncos have won four straight games and prevailed 21-16 over BYU last Saturday on a defensive stop on the game's final play. "Winning these close games, I think, builds more team chemistry and camaraderie than blowing people out by 40," Boise State senior quarterback Brett Rypien told reporters. "Maybe it's not as pretty as everybody wants it to be but at the end of the day we're winning tough games, which is what you want coming down the latter half of the season especially when we've got some big games coming up here." Rypien has a milestone in reach on Friday as he needs just 36 yards to replace San Diego State's Ryan Lindley (12,690 from 2008-11) as the Mountain West leader in career passing yardage. Rypien has 12,655 yards and drew ample praise from Tedford this week. "He's highly competitive. He's really smart, understands what he's doing, very accurate passer," Tedford told reporters of Rypien. "He can throw the deep ball, throws the intermediate ball really well, can scramble and extend plays. "... He's one of the best quarterbacks in the country." The Broncos average 38.0 points per game and Rypien will be trying to solve a Fresno State defense that is allowing an average of 7.2 points in its five Mountain West games. Overall, the Bulldogs are tied for second nationally at 12.3. Junior middle linebacker Jeff Allison is the unit's standout and has recorded a team-high 84 tackles. The Bulldogs are averaging 40.4 points on offense with senior quarterback Marcus McMaryion standing out with 2,416 yards and 20 touchdowns against three interceptions. McMaryion has thrown multiple touchdown passes in each of the past six games. Senior receiver KeeSean Johnson recently became the school's all-time leader in receptions (242) and ranks fourth in yardage (2,981). He has 62 catches for 858 yards and six touchdowns. The Boise State defense, which allows 23.7 points per game, suffered a blow when sophomore outside linebacker Ryan Whimpey suffered a season-ending ACL injury against BYU. Whimpey leads the Broncos with 55 tackles. "Its unfortunate," Broncos coach Bryan Harsin said of Whimpey's injury at a press conference, "but we're not the only team in America that has guys hurt."